Well, this was it. Six years of planning, it's the middle of October 2006 and we we're down to the last 2 weeks before our projected departure. We rented a uhaul to get the last of our stuff to San Diego to cram into "Hanali". We were up to our eyeballs in last minute projects but somehow it was all getting done. Laura was busy making canvas covers and bug nets for the boat and I was busy doing mechanical stuff. 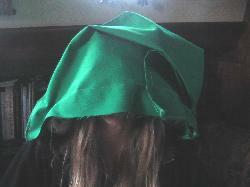 This is Lauras' giant elf hat. It started out as our windlass cover but being it was Lauras' first sewing job it ended up looking like this. As it turns out before we fixed it she got an offer from Cheesy Films to make 12 more for their new up-coming movie "Giant Elves From Mars"
"I was suppose to put the extra material on the inside"? Where's my damn power saw? Well, we made it to Mexico. 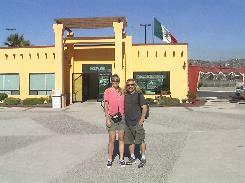 We left San Diego 11/4/06 at about 7am and made it to Ensenada at about 7:30 pm. We did really good doing 6-7 knts most of the way. 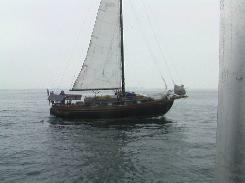 Just before we got into the harbor RTs' boat (Baba 30) lost his power linkage so he had to sail in. Did I mention it was dark ? Awesome! 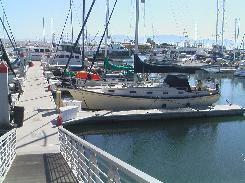 We got a slip at the marina for a couple of days so we could check in to Mexico and enjoy Ensenada. 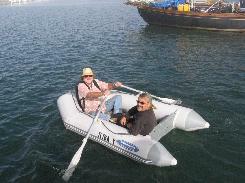 RT and myself heading to the office to check in after anchoring outside the marina the first night.